The flowers are so small and dainty; you could miss them. However, the fragrance is heavenly. Which is why designers, landscapers and homeowner should put them close to an entryway or high traffic area. Since witch hazels flower anytime between mid-February through March, they can easily be missed. Witchhazels, Hamamelis spp., are large shrubs that have several desirable attributes, and offer year-round interest in the landscape. They are one of the first to flower, have a pale green foliage, yellow fall color and small fruit in winter. Three cultivars are available through nurseries and select garden centers. 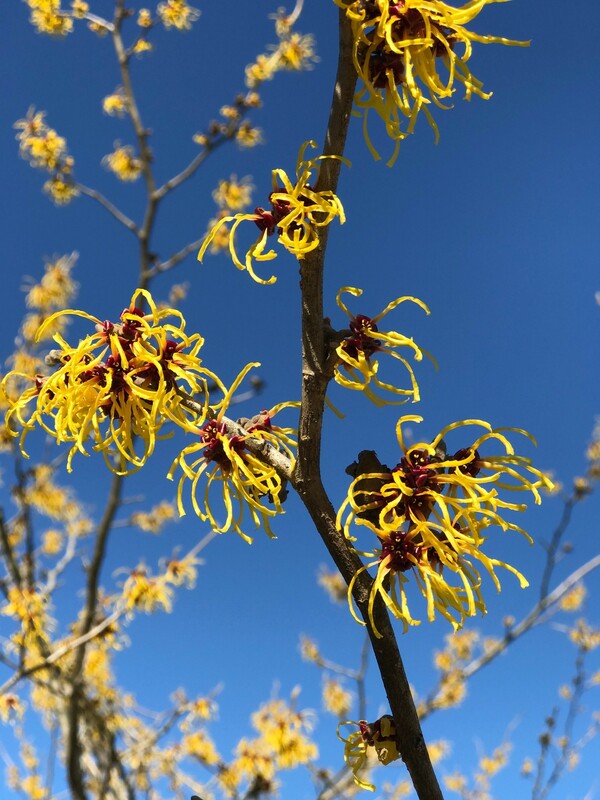 They include: Hamamelis intermedia ‘Arnold Promise’, Hamamelis intermedia ‘Jelena’, sometimes called ‘Copper Beauty’ and Hamamelis intermedia ‘Diane’. With regard to availability of these plants to gardeners, you may have to search but you will be rewarded. Plants are typically upright spreading and rather loosely branched reaching a height of 4-12 feet depending on variety. The flowering time tends to be late winter, usually in the mid-February through March depending on the temperature and conditions of late winter and early spring. One of the best yellow-flowered cultivars is ‘Arnold Promise’ which was developed at the Arnold Arboretum. Another great cultivar is ‘Jelena’ or ‘Copper Beauty’ as it is sometimes listed or Hamamelis intermedia ‘Jelena’. This plant has an orange to copper colored flower. A third cultivar is Diane or Hamamelis intermedia ‘Diane’ has a true red flower color. Witch hazels….the forgotten wonder! The flowers are so small, early and dainty; you could miss them but not the fragrance.